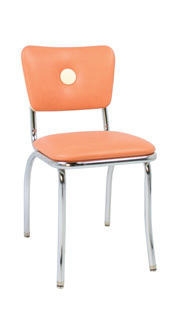 The C1BB Button Back Retro Diner Chair features an upholstered curved back with large button. Proudly Made in the USA, and built to last! Our C1BB Button Back Retro Diner Chair is available in your choice of vinyls, including the very cool zodiac, sparkle, and cracked ice. This diner chair provides the perfect retro 1950’s look.